A good restart/respring application is a necessity on any iPhone or iPod Touch (at least if you are doing any sort of customizing or SSHing). 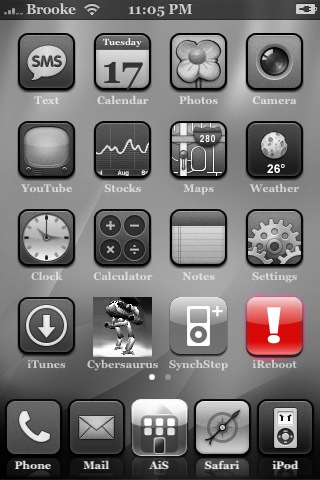 So, I thought I would run through the options that are currently available on 2.0 via Cydia. As of now, there are four application that allow you to restart/respring your iPhone; iReboot, PowerTool, Respring and BossPrefs. 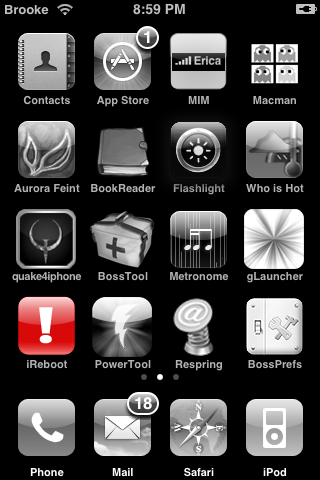 All of these apps are pretty much the same if not exactly the same as they were in 1.1.4 and below…they have just been ported to the 2.0 firmware. 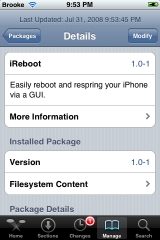 iReboot gives you the option to Reboot your iPhone which brings you all the way out to the boot logo screen or the option to Restart your iPhone which will bring you to the lock screen. 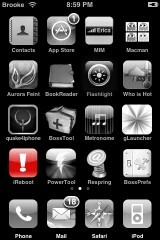 PowerTool is an application that allows you to respring and reboot your iPhone. 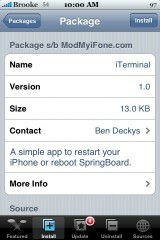 THe application will open to the main page in which you have the options to; Set Language which will restart your iPhone without going to the lock screen, Restart SpringBoard which will restart your SpringBoard bringing it to the lock screen and Reboot which will bring you to the boot logo screen. When I tested the application, all the options work exactly as they should. 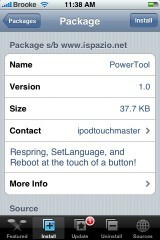 PowerTool is available through the iSpazio source. Do not install this application. I have tried several times to install PowerManager and each time I do, my iPhone gets stuck on the spinning wheel of death. I try everything to get out of it but, I end up having to SSH in and delete the application folder. I would recommend not installing this application. It is through the ModMyiFone source. Update: I tested this on another iPhone and it seems to be working fine. 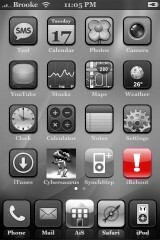 So, I tried it again on my iPhone and it still crashes it. It must be conflicting with another application. I would say install at your own discretion. Ok, now that I have this application working on an iPhone…here is a review. 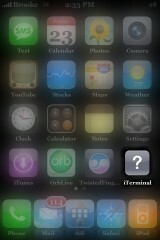 iTerminal is an application that allows you to Respring and Reboot your iPhone. When you open the application, you will get a pop-up informing you that iTerminal should only be used for a purpose and not just for fun. I’m not really sure what they mean by that! 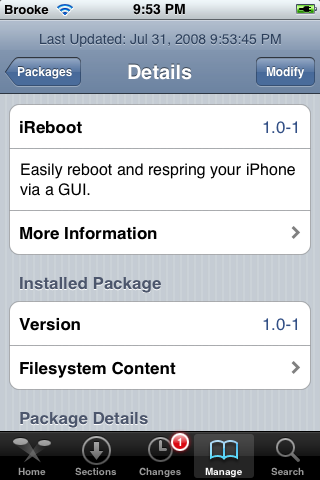 Once you have selected ok, you will get a screen with the Reboot and Respring options. When you select either of the options, you will get a pop-up with the option Yes and No. 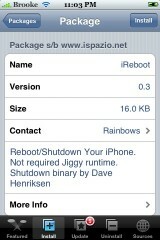 The Respring option worked fine for me however, the Reboot option did not work at all. When I selected Reboot and then Yes, it just stayed on the screen saying it was processing. I ended up killing the process. 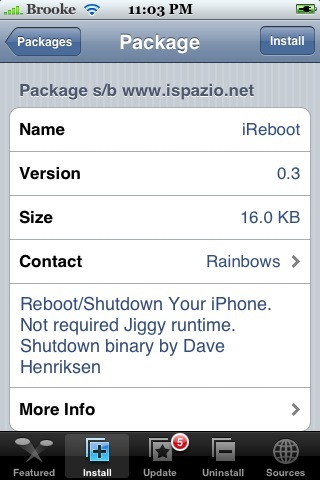 I would say until the Reboot features works, there are other application that Respring your SpringBoard (Restart, KillBoard and Respring) so, I would say that this application is not needed. iTerminal is available through the ModMyiFone source.